مهدی چاری, محمد, داوری, کامران, قهرمان, بیژن, ضیایی, علی نقی. (1396). ارایه معادله عمومی پسروی آب در آبیاری نواری. نشریه آبیاری و زهکشی ایران, 11(5), 722-735. محمد مهدی چاری; کامران داوری; بیژن قهرمان; علی نقی ضیایی. "ارایه معادله عمومی پسروی آب در آبیاری نواری". نشریه آبیاری و زهکشی ایران, 11, 5, 1396, 722-735. مهدی چاری, محمد, داوری, کامران, قهرمان, بیژن, ضیایی, علی نقی. (1396). 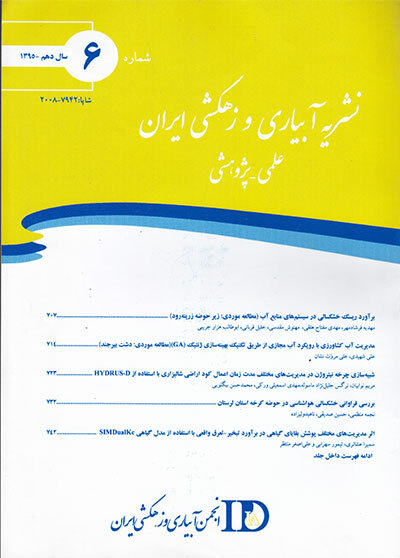 'ارایه معادله عمومی پسروی آب در آبیاری نواری', نشریه آبیاری و زهکشی ایران, 11(5), pp. 722-735. مهدی چاری, محمد, داوری, کامران, قهرمان, بیژن, ضیایی, علی نقی. ارایه معادله عمومی پسروی آب در آبیاری نواری. نشریه آبیاری و زهکشی ایران, 1396; 11(5): 722-735. تعیین منحنی پسروی جهت ارزیابی آبیاری نواری دارای اهمیت بسیاری می­باشد. با توجه به متغیر بودن نوع خاک و همچنین شرایط اولیه و مرزی در آبیاری نواری، سرعت پسروی آب در نوار­های مختلف بسیار متفاوت می­باشد. در سال­های اخیر روش مقیاس­سازی به عنوان ابزاری جهت کاهش داده­های اندازه­گیری و تدوین و فرموله کردن معادلات مربوط در مسایل آب و خاک مورد استفاده قرار گرفته است. هدف از این پژوهش، ارایه معادله­ای یکتا و مستقل از شرایط اولیه و خاک، جهت پسروی آب در نوار با استفاده از مقیاس­سازی است. برای این منظور، آبیاری نواری با استفاده از مدل موج سینماتیک و کاربرد معادله نفوذ فیلیپ دو جمله­ای برای مولفه­ی نفوذ، حل گردید. عوامل مقیاس به گونه­ای تعریف شدند که معادله موج سینماتیک مستقل از شرایط اولیه و خاک گردد. نتایج نشان داد که عوامل مقیاس مورد استفاده در این تحقیق از توزیع لوگ- نرمال پیروی می­کنند. از آنجا که منحنی­های پسروی مقیاس­شده به معادله­ی مشخصی میل می­کردند در نتیجه، معادله­ی درجه 2 جهت پسرفت آب در نوار ارایه گردید. معادله­ی به­دست آمده با استفاده از مقیاس­سازی، برای 25 نوار شامل نوارهای کشت نشده و نوارهای کشت شده و شیب­های 001/0 تا 005/0، زبری 017/0 تا 211/0، طول 4/91 تا 100 متر و دبی 08/0 تا 16/0 مترمکعب بر دقیقه بر متر مورد ارزیابی قرار گرفت. جهت ارزیابی، از چهار شاخص آماری ضریب تبیین (R2)، توزیع نسبت به خط 45 درجه (λ)، درصد متوسط خطای پیش­بینی مدل (Er) و درصد متوسط خطای نسبی مدل (Ea) استفاده گردید. نتایج نشان داد که معادله ارایه گردیده با استفاده از مقیاس­سازی با 94/0R2=، 046/1=λ، 6/4=Er و 52/7=Ea به شکل مناسبی کار پیش­بینی منحنی پسروی را انجام می­دهد. نتایج نشان داد که میانگین درصد مطلق خطا برای زمان پسروی در نوارهای کشت نشده برابر با 78/6 و برای نوارهای کشت شده برابر 08/8 بوده و دقت معادله ارایه گردیده برای هر دو شرایط کشت شده و کشت نشده مناسب می­باشد. به طور کلی، نتایج نشان داد که معادله­ی به دست آمده از روش مقیاس­سازی، با توجه به شکل ساده و عدم وابستگی به نوع خاک، با دقت قابل قبولی پسروی آب در نوار را پیش­بینی می کند. Determination of recession curve for evaluation of border irrigation is of prime importance. Due to variability of soil types, as well as initial and boundary conditions in border irrigation, water advance rate varies considerably indifferent borders. In recent years,scaling approach has been adopted to reduce number of measurements, and to formulate governing equations. The aim of this study was to develop a unique equation, independent of initial and boundary conditions, for evaluation of water recession in borders,by using scaling approach. For this purpose,we considered kinematic wave model and Philip’s 2-termequation for border irrigation. The scaling factor was defined, so as the kinematic wave equation is independent of initial conditions and soil properties.Results showed that the scaling factor follows Log-normal distribution. A quadratic equation was fitted to define recession of water. The equation was evaluated for 25 borders under cultivated and uncultivated and inciuding different slopes of 0.001 to 0.005, roughness of 0.017 to 0.211, length of 91.4 to 100 m and flow rate of 0.08 to 0.16 m3/min.m.For indices of coefficient of determination (R2), comparison with perfect line of agreement, percentage of model prediction error (Er), and percentage of average relative error (Ea) were used. The results showed that the proposed equation based on scaling performed well (R2 =0.94, λ=1.046, Er=4.6 and Ea=7.52). Results showed that the mean absolute percent error for recession time was 6.78 and 8.08 for uncultivated andcultivated border, respectively,which are nearly the same. On the overall, border recession was simulated under scaling method which is simple and independent of soil type. صادقی،م.، قهرمان،ب.، داوری،ک. 1387. مقیاس­سازی و پیش­بینی نیمرخ رطوبت خاک در فاز توزیع مجدد. مجله آب و خاک. 22.2: 417-431. قهرمان،ب.، صادقی،م.، داوری،ک.، گهردوست منفرد،م.ر. 1390. مقیاس­بندی منحنی مشخصه رطوبتی خاک­های غیرمتشابه. مجله پژوهش آب ایران. 9: 113-120. مهرابی،ف.، سپاسخواه،ع. 1392. مقیاس­بندی و بررسی تغییرات مکانی ویژگی­های نفوذ در خاک در مقیاس حوزه آبریز ( مطالعه موردی : دشت باجگاه). 14 .1: 13-32. Alazba,A.A. 1999. Dimensionless advance curves for infiltration families. Agriculture Water Managament. 41: 115-131. Atchison,KT. 1973. Retardance coefficient and other data for a vegetated irrigation border. Unpublished MSc. Thesis. University of Arizona. Tucson. USA. Bautista,E. Schlegel,J. Strelkoff,T.S. 2012. WinSRFR 4.1, Software and User Manual USDA-ARS U.S. Arid Land Agricultural Research Center Maricopa. AZ USA. Clemmens,A.J. 1981. Evaluation of infiltration measurements for border irrigation. Agriculture Water Managament. 3: 251-267. Clemmens,A.J. 2007. Simple approach to surface irrigation design: Theory. Journal of Land and Water. 1: 1-19. Ebrahimian,H., Liaghat,A. Ghanbarian-Alavijeh,B and Abbasi,F. 2010. Evaluation of various quick methods for estimating furrow and border infiltration parameters. Irrigation Science. 28.6: 479-488. Elliott,R.L., Walker,W.R and Skogerboe,G.V. 1983. Furrow irrigation advance rate: A dimensionless approach. Trans ASAE. 26.6: 1725-1731. Esfandiari,M and Maheshwari,B.L. 2001. Field evaluation of furrow irrigation models. Journal Agricultural Engineering Research. 79.4: 459-479. Gillies,M.H and Smith,R.J. 2005. Infiltration parameters from surface irrigation advance and runoff data. Irrigation Science. 24.1: 25-35. Katopodes,N.D and Strelkoff,T. 1977. Dimensionless solutions of border irrigation advance. Journal Irrigation and Drainage Engineering ASCE. 103.4: 401-417. Khatri,L and Smith,RJ. 2005. Evaluation of methods for determining infiltration parameters from irrigation advance data. Irrigation and Drainage. 54: 467-482. Khatri,K.L and Smith,R.J. 2006. Real-time prediction of soil inﬁltration characteristics for the management of furrow irrigation. Irrigation Science. 25.1: 33-43. Kosugi,K and Hopmans,J.W. 1998. Scaling water retention curves for soils with lognormal pore-size distribution. Soil Science Society of America Journal.. 62: 1496-1504. Kozak,J.A and Ahuja,L.R. 2005. Scaling of infiltration and redistribution of water across soil textural classes. Soil Science Society of America Journal.. 69.3: 816-827. Machiwal,D., Madan,K.J and Mal,B.C. 2006. Modelling infiltration and quantifying spatial soil variability in a wasteland of Kharagpur, India. Biosystems Engineering.. 95.4: 569-582. McClymont,D.J and Smith,R.J. 1996. Infiltration parameters from optimization on furrow irrigation advance data. Irrigation Science. 17.1: 15-22. Miller,E.E and Miller,R.D. 1956. Physical theory for capillary flow phenomena. Journal Applied Physics. 27: 324-332. Navabian,M., Liaghat,A.M., Smith,R.J and Abbasi,F. 2009. Empirical functions for dependent variables in cutback furrow irrigation. Irrigation Science. 27: 215-222. Philip, J.R. 1957. The theory of infiltration-3: Moisture profiles and relation to experiment. Soil Science. 84: 163-178. Ram,R.S. 1969. Hydraulics of recession flow in border irrigation system. MSc. Thesis. Indian Institute of Technology.. Kharagpur, India. Ram,R.S. 1972. Comparison of infiltration measurement techniques. Journal Agriculture Engineering. India. 9.2: 67-75. Ram,R.S and Lal,R. 1971. Recession flow in border irrigation. Journal Agriculture Engineering. India.. 8.3: 62-70. Ram,R.S and Singh,V.P. 1982. Evaluation of models of border irrigation recession. Journal Agricultural Engineering Research. 27: 235-252. Ram,R.S and Singh,V.P. 1985. Application of kinematic wave equations to border irrigation design. Journal Agricultural Engineering Research. 32: 57-71. Rasoulzadeh,A and Sepaskhah,A.R. 2003. Scaled infiltration equations for furrow irrigation. Biosystems Engineering. 86.3: 375-383. Roth,R.L. 1974. Data for border irrigation models. Transactions of the ASAE.. 17.1: 157-161. Sadeghi,M., Ghahraman,B., Ziaei,A.N., Davary,K and Reichardt,K. 2012. Invariant solutions of Richards’ equation for water movement in dissimilar soils. Soil Science Society of America Journal.76.1: 1-9. Sadeghi,M., Ghahraman,B., Davary,K., Hasheminia,S.M and Reichardt,K. 2011. Scaling to generalize a single solution of Richards’ equation for soil water redistribution. Science Agricultural. 68: 582-591. Sadeghi,M., Ghahraman,B., Warrick,A.W., Tuller,M and Jones,S.B. 2016. A critical evaluation of the Miller and Miller similar media theory for application to natural soils. Water Resource Research. 52.4: 1-18. Sharma,M.L., Gander,G.A and Hunt,C.G. 1980. Spatial variability of inﬁltration in a watershed. Journal of Hydrology. 45: 122-101. Shepard,J.S., Wallender,W.W and Hopmans,J.W. 1993 One method for estimating furrow inﬁltration. Transactions of the ASAE. 36.2: 395-404. Strelkoff,T and Clemmens,A.J. 1981. Dimensionless stream advance in sloping borders. Journal Irrigation and Drainage Engineering ASCE. 107.4: 361-382. Strelkoff,T and Clemmens,A.J. 1994. Dimensional analysis in surface irrigation. Irrigation Science. 15.2-3: 57-82. Strelkoff,T. 1977. Algebraic computation of flow in border irrigation. Journal Irrigation and Drainage Engineering ASCE 103: 357-377. Strelkoff,T and Katopodes,N.D. 1977. Border irrigation hydraulics with zero inertia. Journal Irrigation and Drainage Engineering ASCE 103.3: 325-342. Tuli,A., Kosugi,K and Hopmans,J.W. 2001. Simultaneous scaling of soil water retention and unsaturated hydraulic conductivity functions assuming lognormal pore-size distribution. Advance Water Resource. 24: 677-688. Upadhyaya,S.K and Raghuwanshi,N.S. 1999. Semiempirical infiltration equation for furrow irrigation systems. Journal Irrigation and Drainage Engineering ASCE. 125.4: 173-178. Valiantzas,J.D., Aggelides,S and Sassalou,A. 2001. Furrow infiltration estimation from time to a single advance point. Agriculture Water Managament. 52: 17-32. Walker,W.R. 2003. SIRMOD III: Surface irrigation simulation, evaluation and design. Guide and technical documentation. Department. of Biological and Irrigation Engineering. Utah State Uuniv., Logan, Utah. Walker,W.R and Humpherys,A.S. 1983. Kinematic-wave furrow irrigation model. Journal Irrigation and Drainage Engineering ASCE. 109.4: 377-392. Walker,W.R and Skogerboe,G.V. 1987. Surface Irrigation: Theory and Practice. Englewood Cliffs, New Jersey. 386 p. Warrick,A.W., Mullen,G.J and Nielsen,D.R. 1977. Scaling of field measured hydraulic properties using a similar media concept. Water Resource Research. 13.2: 355-362. Warrick,A.W and Hussen,A.A. 1993. Scaling of Richards’ equation for infiltration and drainage Soil Science Society of America Journal. 57: 15-18. Warrick,A.W and Nielsen,D.E. 1980. Spatial variability of soil physical properties in the field. PP. 319-344. In: D.I. Hillel (Ed.). Application of Soil Physics. Academic Press, New York. Wu,I.P. 1972. Recession flow in surface irrigation. Journal Irrigation and Drainage Engineering ASCE. 98: 77-89. Yitayew,M and Fangemeier,D.D. 1984. Dimensionless runoff curves for irrigation borders. Journal Irrigation and Drainage Engineering ASCE. 110: 179-191. Yu,F.X and Singh,V.P. 1989. Analytical model for border irrigation. Journal Irrigation and Drainage Engineering ASCE. 115: 982-999.